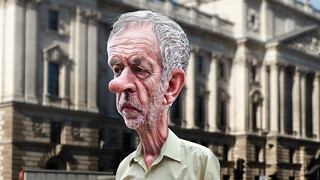 Jeremy Bernard Corbyn, aka Jeremy Corbyn, is a British Labour Party politician who has been the Member of Parliament for Islington North since 1983. Corbyn is a candidate in the 2015 Labour Party leadership election. This caricature of Jeremy Corbyn was adapted from a Creative Commons licensed photo from Garry Knight's Flickr photostream. The background was adapted from a Creative Commons licensed photo from lutefisk73's Flickr photostream.